If you try to translate caldo where caldinha is a derived from it means broth or soup. Judging by the flavor and lack of spiciness in caldinha it makes sense that it is named aptly. It is spelt in two ways Caldine or Caldinha. If you type Caldinho then you find that it is a Brazilian recipe for a Bean Soup. This recipe does bring back a lot of memories. When we would visit my father’s family on a small beautiful island called Ilha(Island) de Santo Estevão you can read more about this Island here. Fresh fish was always in abundance and my dad loved this sweet curry specially since he suffers from stomach ulcers and cannot eat very spicy foods. I think if you like less hotter Indian curries then this is a great recipe. 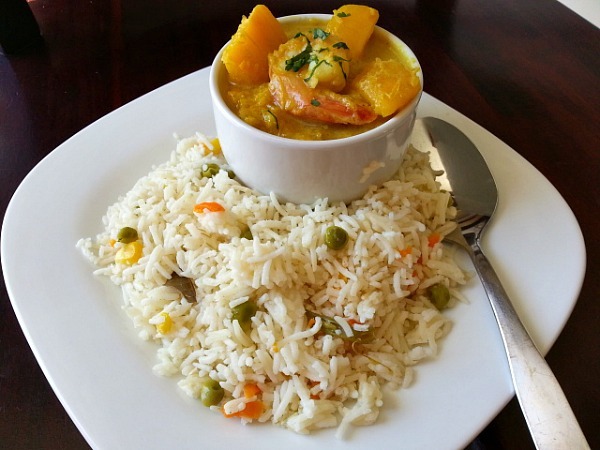 Caldinha is a light yellow-green curry which is made with fish and coconut milk. In Goa, fish like sardines, mackerel, pomfret and king fish are very popular along with other smaller fish. 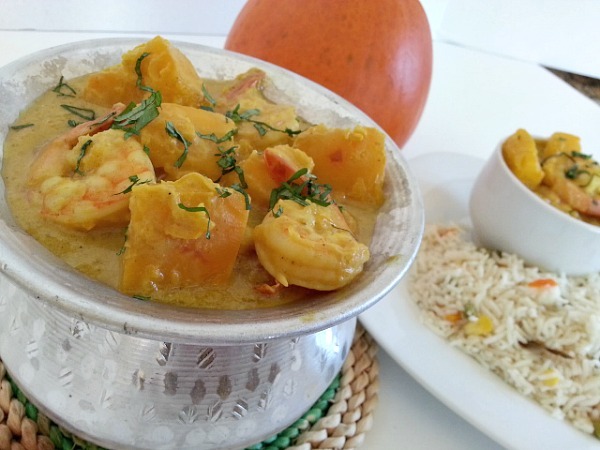 Since it is fall here in the US, I decided to combine it with sweet pumpkin and shrimps and it turned out to be delicious. * Wash and clean the shrimps/prawns apply salt, vinegar and keep aside. 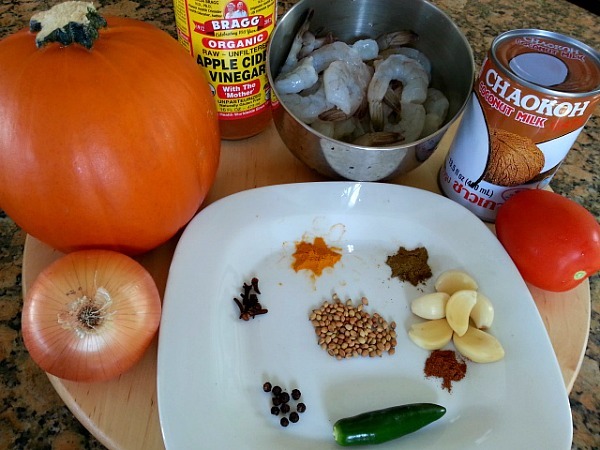 * Grind the garlic, dry spices and jalapeno along with 1/4 can of coconut milk in a blender. * In a hot-pot add onions and saute for 3-4 minutes till translucent. Next add the diced tomatoes and saute till soft. * Add the ground mixture, pumpkin, remaining coconut milk, water mix and cook covered on medium heat for 5 minutes till pumpkin softens. * Finally add the shrimps, check on salt and cook covered on medium heat for another 5-10 minutes depending how you like your shrimps cooked. Enjoy with rice or bread. Caldinha keeps well for a couple of days in the refrigerator. Love pumpkin then check out more recipes for Creme Brulee in Mini Pumpkin and Sauteed Pumpkin Recipe. I can’t wait for pumpkin season to try this recipe out..I think it will be a big hit with my kids since it is sweet and not too spicy..Thanks for all your great recipes Nandini..Keep ’em coming…I love your passion for our food and culture. Viva. Thanks Michelle for your kind words, appreciate it very much :-). I hope you do give it a try. Please let me know how it goes. Just came across this recipe…looks lovely. 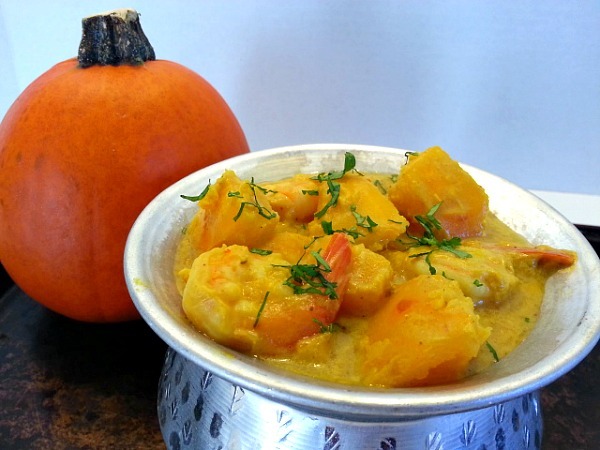 Coincidently I made Shrimp-pumpkin curry a couple of days ago, very similar. Couple of differences were that I pureed half of the pumpkin and also added Harissa to the curry. Thanks Anagha and appreciate you sharing your version. It looks like I missed this post yet again Nandini, since I am not very good at following The Reader, where all the posts I follow come up. Love caldinha and yours looks fantastic, adding some pumpkin must have given it that nice variation. Will have to make this for sure, and with the cooler weather, this will work a treat. I’m taking a wee break from my cooking posts and now concentrating a bit on Travel. Cheers! No, I meant I’m now going to be blogging on travel posts, I have so many great pictures and stories from past travels, so I’m giving cooking a break. 🙂 Actually may just post a caramel bread pudding I made ages ago, and I’d like to tag your site, because you explain the Goan traditions so well. So many of my friends in the USA don’t even know where Goa is. So I’ll mention your site in my post if that’s ok? I love the way you present the ingredients in your photos. Not only does this recipe sound delicious, but I can actually see what goes into it. Nicely done. Going to make this as soon as my tummy feels better. Sounds delicious! I hope you do get better soon. I hope you do enjoy it Sandra, it’s a rich creamy curry. Looks delicious and like something the whole family would like – will definitely try this recipe! Thanks for the follow! You have an amzing array of recipes. I was aware of Goan culture but I hadn’t known that it was influenced by the Portuguese. I love learning new things! This can be such a yummilicious Halloween treat! Yum. Am going to try this one. Goan curry is a favourite of mine! Do you think you could substitute a squash or sweet potato for the pumpkin?